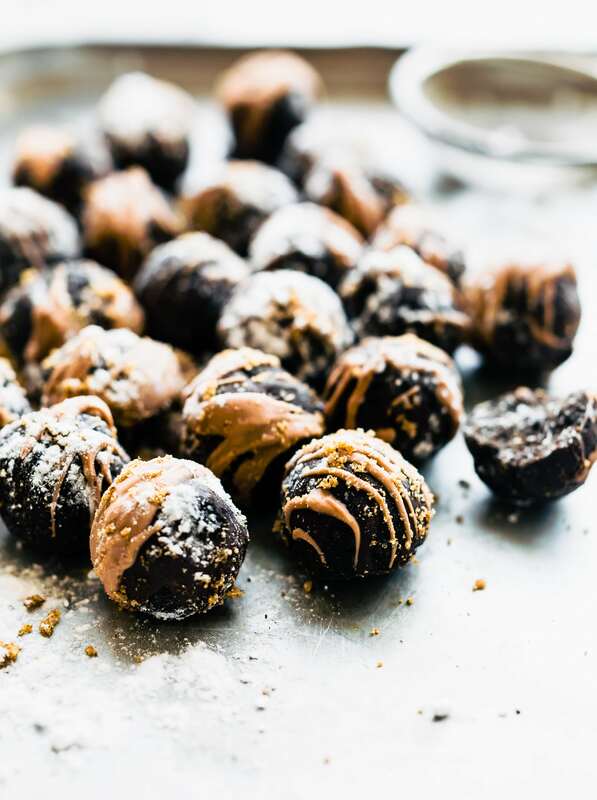 Dark Chocolate-Amaretto Cake Bites that require no baking and just a few simple ingredients. Almond butter, cocoa, almond flour, almond extract, maple syrup, dark chocolate, and Amaretto. Perfect for the holidays and parties! 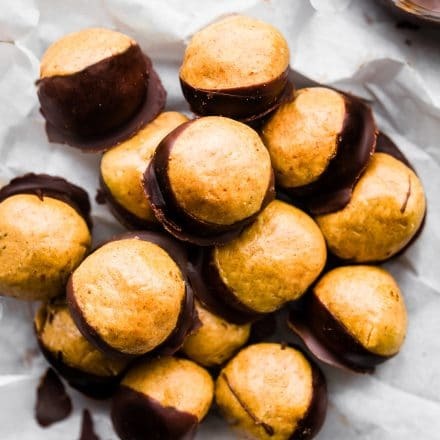 This bite size dessert recipe is easy make non alcoholic, plus it’s vegan friendly. 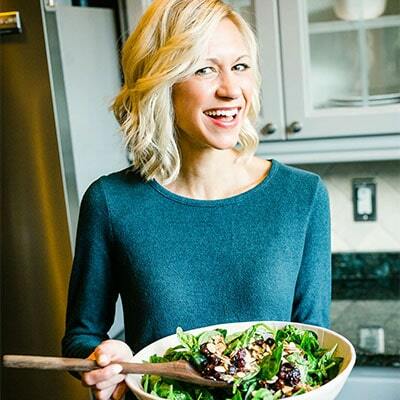 Say hello to the worlds easiest grain free Chocolate-Amaretto Cake recipe. In cake bite form! Okay but first! You must promise me something. You are not allowed to judge my confession. I don’t care if you are a chocolate lover or super clean on sugar eater. I don’t care if you are paleo or vegan. I don’t care if you enjoy liquor or never drink it. The fact is, this is a no judge zone. Capeesh? I just ate boozy cake bites for breakfast. … with coffee… and I enjoyed EVERY BITE. Says the Gluten free nutrition specialist. Blasphemy. Gasp! You see, this is what happens when you make something delicious pre-holidays. Meaning, I have no one else to share these with except my husband, his co-workers, and my favorite neighbor. Except.. I don’t think they drink and I surely don’t want them to accidentally give these to their kiddos. OMG, how funny (and embarrassing) would that be? I mean, don’t get me wrong, these Dark Chocolate Amaretto cake bites have a non alcoholic version, but the ones I just made (and ate) are totally boozy. The real deal Amaretto ya’ll! Not the extract. So yes, I had a boozy chocolate cake dessert bite for breakfast. There could be worse things in life. But let’s back the boozy train up for a minute. Do you think there is room in life for cake, liquor, and dark chocolate?! Obviously I think YES, indeed. Depending on your current state of health, that is. Here’s where I try to justify my actions and recipe in lists form. Let’s examine, shall we? For the past three I’ve shared a boozy no bake bread/cake bites recipe right around certain holidays. 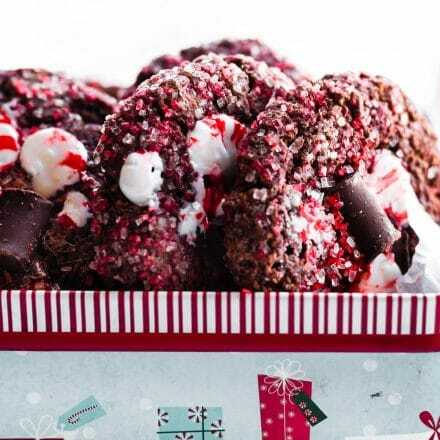 These recipes are meant to serve as a quick easy recipe to share with others; whether that be at a party, gathering, or even as a gift. I never once think of these dessert cake bites as “indulgent food” only and here’s why. The amount of alcohol in each bite is trivial. It’s mainly for flavor. Unless you eat the whole batch in a sitting. I don’t recommend that though. Capeesh? 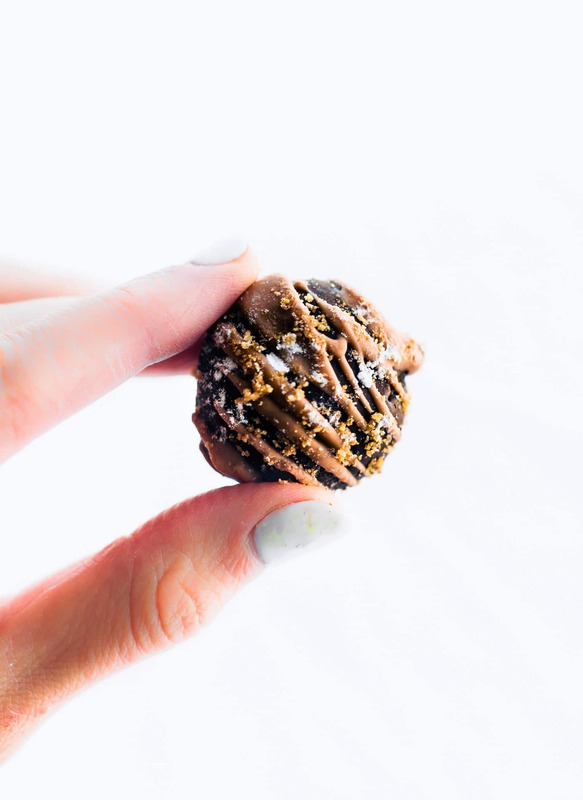 The other ingredients in these so called “cake” bites and dessert bites are made with unrefined sugars, grain free, and vegan friendly ya’ll! Plus the extra dark chocolate is packed with antioxidants, that evens out the liquor, right? Wink wink. We will get to the ingredients in a bit. Hang tight! 1 shot of hard liquor (our in this case Amaretto) is around 100 calories. Now, divide that into 25 bites. That’s 4-5 calories from alcohol per bite. See, not to shabby eh? Okay okay, I’m not justifying that you have a dozen boozy cake bites for breakfast.. ahem, like me. But I am saying this. 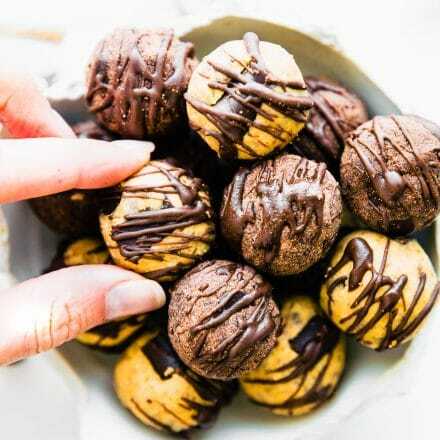 If you want to save time in the kitchen and enjoy cake guilt free (for the most part), then these cake bites are just the thing. Did I also mention they are super filling? Oh yes, for sure. A little goes a long way! So, grab these ingredients and let’s get the ball rolling. I mean cake bite … rolling? Meh. My Pun failed. 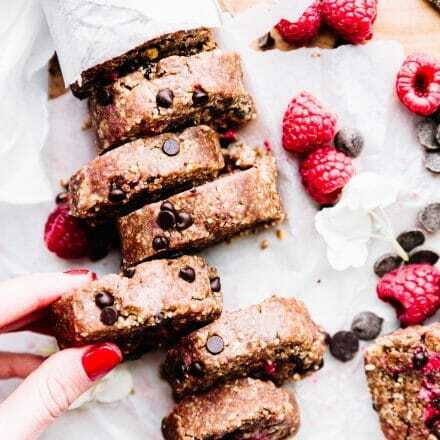 For the Ameratto “cake bite” batter you will need 👉 👉almond flour, unsweetened cocoa, coconut flour, coconut sugar, vanilla, sea salt, almond butter, Amaretto (or amaretto and almond extract), Maple syrup. For the Dark Chocolate Coating you will need 👉 👉 Dark chocolate chips and coconut oil. 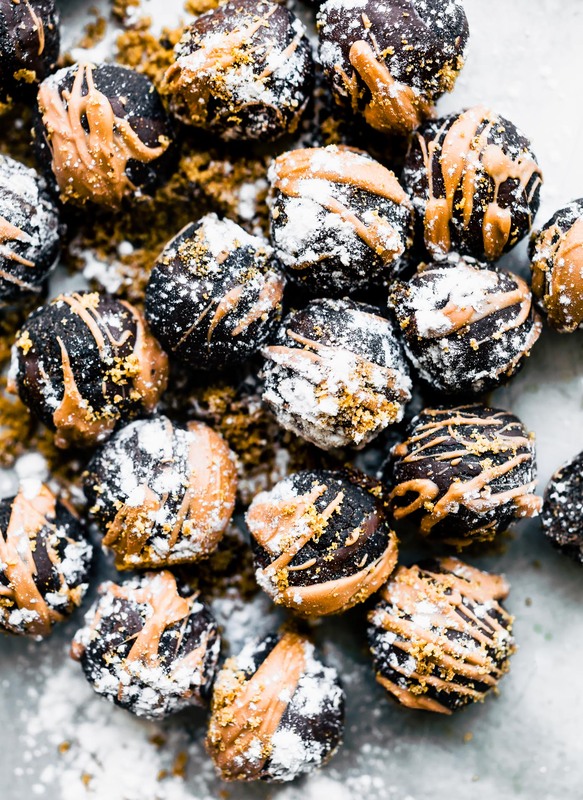 If you want to be daring and LOAD up these cake bites, here’s what you can add 👉 👉 Orange zest, orange extract, chopped nuts, or even melted a butterscotch topping. Daring, I know! P.S if you are going to add the butterscotch topping, I highly recommend using Guittard brand. That was my last list. Promise! 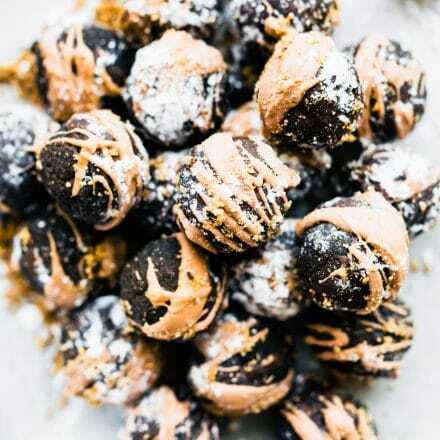 Chocolate-Amaretto Cake Bites! A bite size dessert that requires no baking. 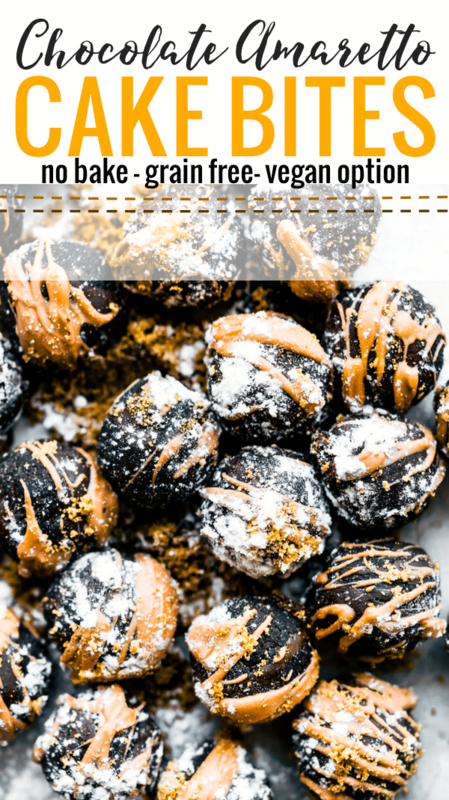 Grain free and vegan option! 1. Sift together your almond flour and coconut flour. Place in a large bowl and add your cocoa powder and coconut sugar (or brown sugar if you don’t have coconut sugar). 2. Add your almond butter. Stir ingredients all together. 3. Add in your maple syrup a little at time, mixing to form a dough batter. Lastly, stir in your amaretto, almond extract, vanilla, and sea salt. 5. Roll into 1-1.5 inch balls and place on cookie tray or plastic ware with parchment paper underneath. 6. Next melt the dark chocolate chips to create a shell. 7. 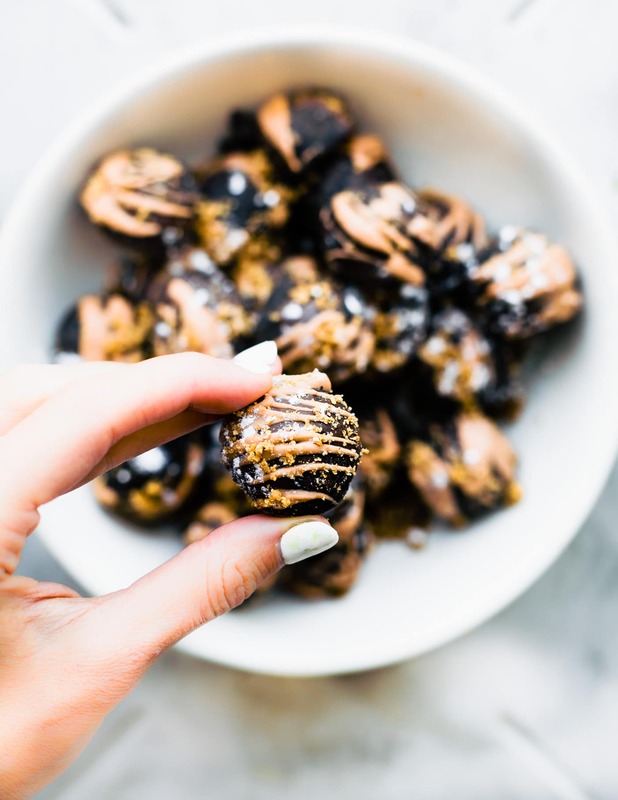 Place dark chocolate chips and coconut oil in microwave. Cook 3x at 30 second intervals, mixing each stop. 8. 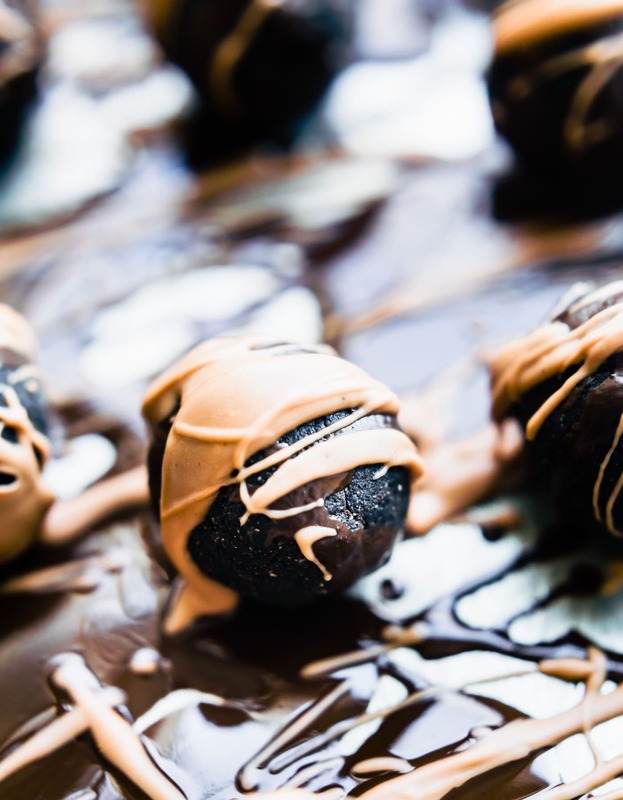 Once chocolate is melted, take a whisk and dip it in your melted chocolate. Drizzle this over the bites. You can also coat the bites in the melted chocolate, if desired. Another topping option is to add melted butterscotch chips. It’s not vegan friendly, but so delicious! See notes. 10. Place in freezer and Let them freeze for 20-30 minutes. 11. Then transfer into sealed container if not using right away. Keep in fridge or freezer for up to 6 weeks. Estimated Nutrition Per Cake Bite varies depending on the amount of dark chocolate and Amaretto you use. If you are going to add the melted butterscotch topping, I highly recommend using butterscotch chips from Guittard brand. NOTE: It is not dairy free. If you don’t have coconut sugar, brown sugar will work or stevia in the raw. Alright my friends, do share.. would you or wouldn’t you eat cake for breakfast? I mean, cake bites.. with Amaretto? You know I’m on board with your boozy balls! Bonus that they’re chocolate. Can I please eat them all in one sitting??? You sure can! Just come over and bring coffee. Mmm k? Mwah! 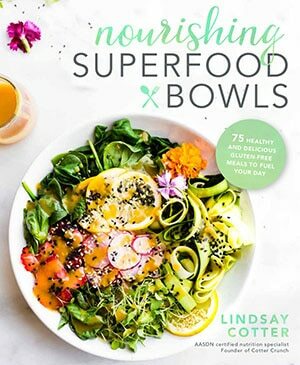 Yes please to these Lindsay! They sound absolutely decadent! I LOVE the addition of the amaretto and that dark chocolate coating! I would have a hard time stopping at just a few! haha yes, that was a hard thing. Stopping. EEK! I would really love to make these but I don’t have coconut flour. Is there something else I could use? Ok girl, you got me here! Chocolate and Almond??? I cant even. I must make these asap! And I’m so glad you did! You know, I think this is the only way anyone can get me drunk. Spike my chocolate, not my drinks. Haha for sure! Or one big yuuuuuuuuuuum! This looks really, really good and your photographs are great. Yes, darling, yes. Yes yes yes! Love these! Um, I would like to order a batch for the holidays please! Can’t believe how easy these are, they look incredible! I love little treats like these! They look amazing! Pinned and I cannot wait to make them! Wow, they look beautiful. I am a big fan of no-bake desserts, and I often incorporate amaretto in my treats. A perfect recipe to make this Holiday season! Love the pictures too!!!! Thank you Mariska! I love Amaretto in desserts too. Hope you try them! These look 100% amazing. SO making! I would never judge a person for eating dessert (or having a taste of booze!) at breakfast! Lol. These look fantastic and so festive! Cn you just throw a dozen in a box and shape em’ to me stat? These look ridiculously good! Love these boozy balls! OH YUM!! I could eat them all! Wanna do a happy hour? 😉 Miss you! Catch up soon? Ummm OBVI I need to be eating breakfast at your house! Ummm that dark chocolate coating is EVERYTHING!